Paddling to Cumberland Island National Seashore is one of the most iconic National Park adventures available in the southeast. This Coastal Georgia barrier island is one of the National Park Service’s crown jewels – miles of sugar-sand beaches, dunes, marsh and maritime forest only accessible by water. There is no bridge to Cumberland Island – only the Park Service ferry, kayaks and War Canoes. If you’re seeking more adventure than simply riding the ferry over to Cumberland Island, paddling there in kayaks or War Canoes is just the ticket. Depending on the winds, tides and destination, paddling trips to Cumberland Island may start from Amelia Island or Crooked River State Park. Regardless of the route, the scenery along the way is stunning. A number of large coastal birds can be seen along the river banks, in the marshes and overhead. Wood Storks, Heron and Egrets, Osprey, Bald Eagles and both Brown and White Pelicans are among some of the more familiar and easy-to-identify species you might see while paddling here. Dolphins patrol all of the tidal rivers on the coast and can often be seen feeding along the Oyster beds. It’s not uncommon to see Manatees and Sea Turtles in the warmer months; and closer to shore you may even see Alligators, Mink and River Otters. In addition to the abundant and fascinating wildlife and nature, Fort Clinch and Kings Bay Naval Submarine Base offer interesting scenery of another nature altogether; and paddlers are occasionally treated to the sight of one of Kings Bay’s submarines leaving or returning from sea. Launching from Amelia Island, the Cumberland Sound seems to branch off in every direction from the narrow entrance between Amelia and Cumberland Island. The Amelia River, Bells River, St. Marys River and Cumberland River each take their share of the incoming tide as the ocean fills the estuaries twice each day. Crossing the Cumberland Sound can be exciting depending on surface conditions. It is easy to imagine what it must have been like for the Timucuan paddling these same waters hundreds of years ago. From Amelia Island, the beach on the southern end of Cumberland Island is easily accessible – as is the Dungeness Dock. From the Dungeness Dock, it’s just a short walk to the Historic District and Dungeness Ruins. The walk to the ruins takes only a few minutes but, before leaving the dock area, visitors should take a few minutes and check out the Ice House Museum and its exhibits. Past the Historic District, a marsh walk and trail lead to the beach – where beach-combing frequently produces sharks’ teeth, sand dollars, starfish, conch shells and other interesting treasures. An 8-foot long whale skull is just one of the remarkable finds washed up on Cumberland’s white sand beach. When tides aren’t favorable for trips leaving from Amelia Island, paddling to Cumberland Island from Crooked River State Park is often an option. 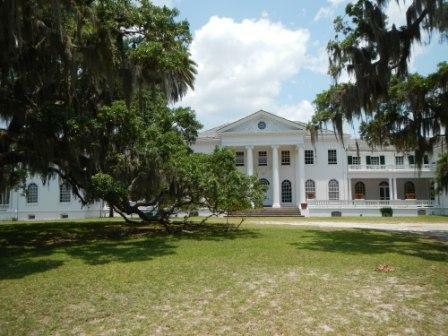 The Crooked River gives paddlers access to the mansion at Plum Orchard – where they can enjoy a picnic under the Live Oaks as wild horses roam freely and graze around the property. Visitors can even get a guided tour of the restored mansion when a Park volunteer is staying on site. With favorable tides, paddling to Plum Orchard is the fastest way to get there. But paddling to Cumberland Island and back can be quite tiring and isn’t for everyone. Kayaking to Cumberland Island is an intermediate-level adventure. Paddlers without a lot of coastal kayaking experience may prefer the stability of a tandem sea kayak to a single. Trips to Cumberland Island are all-day events. The trip to Cumberland Island averages about 2-hours in sea kayaks, followed by at least 2 or 3-hours of activities on the island before another 2-hour paddle back to the put-in. Day trips to Cumberland Island require a minimum of 6-hours of outdoor activity – which can be brutal in the warmer months. Make sure you have plenty of water and stay hydrated. Bringing along sunscreen and insect repellant is also a good idea. War Canoe trips to Cumberland Island are suitable for a wider range of paddlers than are the kayak adventures. War Canoes are big, stable and dry with room for 10-paddlers – making them very fast boats when everyone is paddling. On average, War Canoes will make the trip to Cumberland Island about 30-minutes faster than kayaks. It’s still a big day; but with a group of people paddling and sharing the load, individuals can take breaks without getting separated or feeling like they have to work hard to catch up with the group. War Canoes are perfect for group outings because everyone stays together regardless of stamina or athletic ability. A guided kayak or War Canoe adventure to Cumberland Island is the best way to experience the wild beauty and scenery of the largest of Georgia’s Golden Isles. A day trip to Cumberland Island is a really big day, but it’s definitely worth the effort if you’re up to it. Though the paddle can be strenuous at times, that’s often the price of a good story and great vacation photos nobody else has. Cumberland Island National Seashore may not be the easiest park to get to; but, in a kayak or a War Canoe, getting there is half the fun.